Police in Hollywood recently arrested a suspect who allegedly attempted to pickpocket a victim on Hollywood Boulevard, and then held the victim down and robbed him before fleeing. The incident occurred at approximately 7:20 a.m. on July 3 in the 6300 block of Hollywood Boulevard. The suspect, Curtis Jones, 48, of Los Angeles, allegedly approached the victim on foot and attempted to pickpocket him. When the victim held the suspect away and attempted to flee, Jones allegedly pushed the man to the ground and held him down while he stole property. The victim reported the crime to officers, who later located security camera footage of the robbery. A photograph of the suspect was published on a wanted flyer, and officers from the LAPD’s Hollywood Division arrested Jones on July 25. He was charged with robbery. 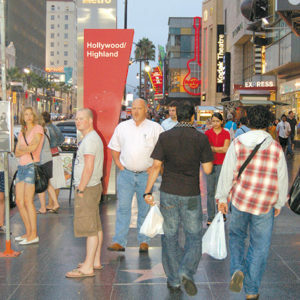 Officer A. Davidson, of the Hollywood Division, said pickpocketing is a crime that occurs frequently along Hollywood Boulevard. Crowds gather in front of the Hollywood and Highland shopping complex, the TCL Chinese Theatre and the El Capitan Theatre. While it is a great place sightseeing and taking photographs, it is also a location where people should be hyper-aware of their surroundings, Davidson said. Statistics on pickpocketing were not available, but Davidson said the crime occurs regularly. He offered suggestions about preventing pickpocketing that pertain to all crowded locations. Davidson said purse snatchings also sometimes occur, but are less frequent. The LAPD prevents crime in the Hollywood Entertainment District using surveillance cameras, and foot and bike patrols. An image from an LAPD surveillance camera was used to identify Jones.